Here we have a kit with all the components you need to produce your very own Arduino compatible. Click here for a full walk-through of how to build this kit. Here we have the finished product ! The only components NOT included are the two 2-pin headers, which represent where external power would be plugged in (the header next to the LED) and where a usb to ttl adapter would be plugged in to upload sketches. Add power and ground wires for where your voltage regulator will be. Add power and ground wires at the bottom of your board connecting each rail. Add the 7805 power regulator and the lines to power the board. The regulator is a TO-220 package where the Input from the external power supply goes input on the left, ground is in the middle and the 5V output is on the right (when facing the front of the regulator). Add power OUT and ground wires that connect to the right and left rails of the breadboard. Also, add a 10uF capacitor between the IN of the regulator and the ground as well as a 10uF capacitor on the right rail between power and ground. The silver strip on the capacitor signifies the ground leg. The red and black wires to the left of the voltage regulator is where your power supply will be plugged in. The red wire is for the POWER and the black wire is for the GROUND. Be sure to only attach a power supply that is between 7-16V. Any lower and you won't get 5V out of your regulator. Any higher and your regulator may be damaged. A 9V battery, 9V DC power supply, or 12V DC power supply is suitable. Now that the power-basics are done you are ready to load on the chip! Before moving on, check out this image. 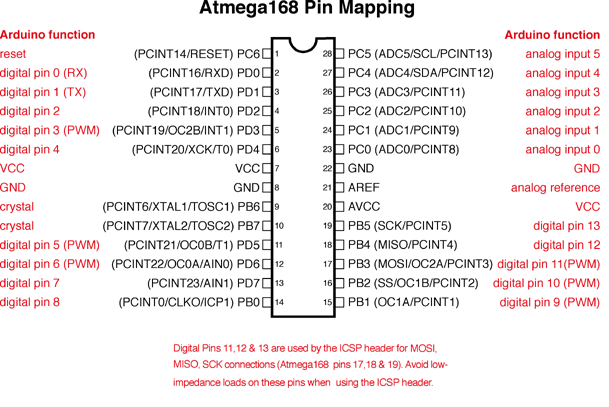 It's a great resource for learning what each of the pins on your Atmega chip do in relation to the Arduino's functions. This will clarify a lot of confusion behind why you hook up certain pins the way you do. Start by connecting a 10k ohm pullup resistor to +5V from the RESET pin in order to prevent the chip from resetting itself during normal operation. The RESET pin reboots the chip when pulled down to ground. In later steps we will show you how to add a reset switch that takes advantage of this. Add a 16 MHz external clock between pin 9 and 10, and add two 22 pF capacitors running to ground from each of those pins. Add the small tactile switch so that you can reset the Arduino whenever we'd like and prepare the chip for uploading a new program. A quick momentary press of this switch will reset the chip when needed. Add the switch just above the top of the Atmega chip crossing the gap in the breadboard. Then, add a wire from the bottom left leg of the switch to the RESET pin of the Atmega chip and a wire from the top left leg of the switch to ground. Add a 0.1 uf capacitor from the RESET pin of the Atmega chip to the middle of the reset switch (unused row). We do this to enable auto reset when uploading sketches. At this point if you had already programmed your chip somewhere else and didn't need this breadboard circuit to reprogram the chip, you could stop here. But part of the fun is in-circuit programming so keep going to really make a full USB-Arduino-circuit on a breadboard! Now we'll be adding the USB to Serial breakout board to our Arduino breadboard circuit. You have a few options here. You could use USB to Serial converters or even an Arduino to interface with this Arduino circuit. Here we setting up RX, TX and RESET further down the breadboard for easy connection to the USB to Serial Module. Notice how RESET is passing through the 0.1 uf capacitor, this enables auto-reset when uploading sketches. Here we have a USB to Serial converter based on the CP2102 chip connected to our circuit. In this example we have an arduino connected to our circuit. Note that the Atmega chip has been removed from the arduino, this allows us to use the onboard FTDI USB to Serial device to interface with our circuit.